In 2007, Congress passed the bi-partisan Energy Independence and Security Act (EISA), which included higher efficiency standards for light bulbs. The goal was to take advantage of new lighting technologies to decrease consumer bills while increasing energy security and resilience. New lighting technologies, such as LED and compact fluorescent light bulbs, last longer and use less energy than the traditional incandescent bulbs that previously dominated the market. Several new lighting technologies—including halogen incandescent, compact fluorescent and LED lighting—currently provide energy savings of up to 75 percent compared to traditional incandescent lighting bulbs. Traditional bulbs produce light by using electric current to heat a wire filament until it starts to glow—90 percent of the energy used by the bulb is lost as heat, making them very inefficient. Energy-saving incandescent bulbs increase bulb efficiency by using halogen gas in the bulb. By law, these new bulbs must use at least 27 percent less energy and will last up to three times longer than traditional incandescent light bulbs. CFLs are simply compact versions of the fluorescent lighting commonly founding household garages and commercial warehouses. CFLs use less electricity to produce light than traditional incandescent lighting, resulting in a 75 percent total energy savings. CFLS can also last up to ten times longer than traditional light bulbs, lowering replacement costs. LEDs are a type of solid-state lighting that use semiconductors to convert electricity into light. Though LEDs have traditionally been used for traffic lights and car-indicator lights, this highly efficient technology has recently been adapted for use in a variety of other technologies.The most efficient LEDs use only 20–25 percent of the energy of traditional light bulbs and can last more than 20 years. Though this technology is not yet available for every lighting need, LEDs are rapidly evolving and are expected to represent 25-35 percent of the lighting market by 2025. Currently, they can be used to replace 40W, 60W and 75W traditional incandescent bulbs, reflector bulbs often used in recessed fixtures and small track lights, including holiday lights.They are also becoming more popular as industrial lighting. 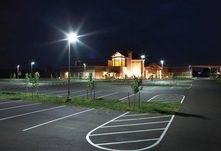 Because LED lights last so much longer than traditional lighting options, they reduce not only the cost and waste associated with traditional bulbs, but can eliminate the labor costs associated with replacing traditional bulbs in difficult to reach areas, such as public streetlights, traffic signals and commercial overhead lighting. 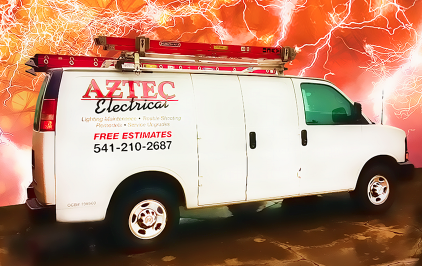 Call Aztec Electrical today at (541) 245-8560 to learn how our services can assist your project and to discover how rebates and incentives can improve your ROI. Adapted from material at the National Conference of State Legislatures web site.